Panzer Dragoon was one of the six original games available during the Saturn’s North American launch. I am not a particular fan of this genre but it was well executed and did a fairly good job demonstrating the Saturn’s abilities, especially for such an early release. This game received generally very good reviews and also did well commercially. 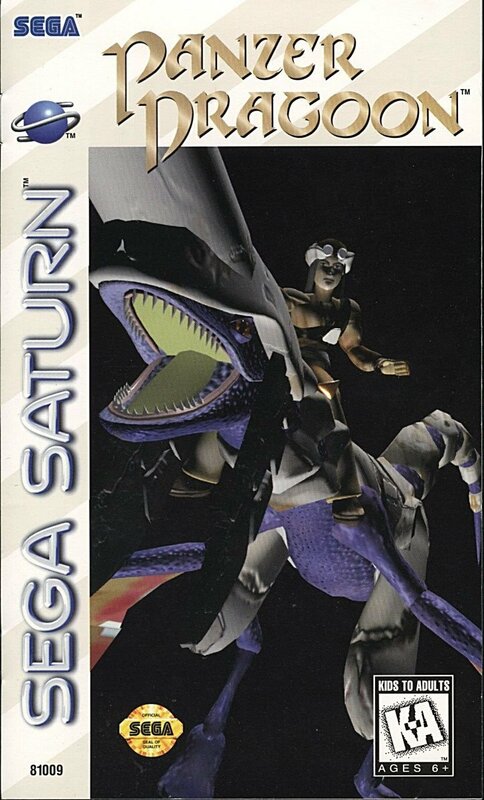 It was successful enough to spawn five more games, three of which were released for the Saturn (including the role-playing game, Panzer Dragoon Saga). In Panzer Dragoon, the player controls a dragon rider (the theme kind of reminds me of Dragon Riders of Pern) and tries to aim and shoot various enemies with their dragon’s laser or their own gun. The player rides on a dragon that automatically flies through various levels so the only thing for the player to do is to aim and shoot though the dragon does follow the player’s aim. Over the years, the original Panzer Dragoon was ported to other systems. First, in 1997 for Windows. This was pretty much a straight port but with higher resolution. This version was also included as a bonus in the 2002 Xbox release Panzer Dragoon Orta. Finally, in 2006 there was a version released for the PS2 as part of the “Sega Ages 2500” collection. It included both the original Saturn version and an improved version with better graphics.